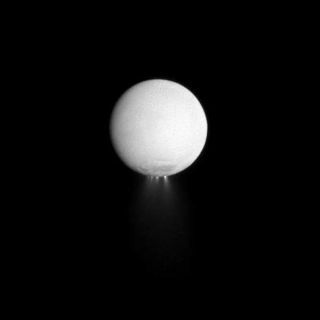 At least four distinct plumes of water ice spew out from the south polar region of Saturn's moon Enceladus. The image was taken in visible light with the Cassini spacecraft narrow-angle camera on Dec. 25, 2009. The strong pull of Saturn's gravity stretches and strains huge cracks on one of the planet's icy moons that spray icy, geyser-like jets, a new study finds. New images from NASA's Cassini spacecraft, in orbit around Saturn, reveal clues that have enabled scientists, for the first time, to make a connection between Saturn's gravity and the jet-spewing fissures on the planet's sixth largest moon, Enceladus. "This new work gives scientists insight into the mechanics of these picturesque jets at Enceladus and shows that Saturn really stresses Enceladus," Terry Hurford, a Cassini scientist at NASA's Goddard Space Flight Center in Greenbelt, Md., said in a statement. The findings were presented Monday (March 19) at the 43rd Lunar and Planetary Science Conference at The Woodlands, Texas. These images, based on ones obtained by NASA's Cassini spacecraft, show how the pull of Saturn's gravity can deform the surface of Saturn's moon Enceladus in the south polar region crisscrossed by fissures known as "tiger stripes." Astronomers have long been intrigued by the huge fissures on the Enceladus' ice-covered surface that eject plumes of water vapor and icy particles. The long fissures in the moon's south polar region are nicknamed the "tiger stripes." The researchers found that the tiger stripes are strained the most when Enceladus swings closest to Saturn in its orbit. The ringed planet's gravitational pull could also stretch and deform the fissures, they added, which controls the timing of the spewing jets In fact, the researchers found that this type of deformation seemed to occur often as Enceladus' circled Saturn, even when the moon was very far away. These results suggest that Enceladus would need to have a large body of liquid water — a global or local ocean — for it to contract and stretch enough to deform the surface, Hurford said. The findings also suggest that Saturn's tidal movements generate a great deal of heat in the area. "Cassini's seven-plus years roaming the Saturn system have shown us how beautifully dynamic and unexpected the Saturn system is over time," Linda Spilker, Cassini project scientist at NASA's Jet Propulsion Laboratory in Pasadena, Calif., said in a statement. "We're looking forward to new discoveries as the seasons turn." The Cassini spacecraft was launched in 1997 and arrived at Saturn in 2004. The probe has since received two mission extensions, the latest one lasting through 2017. The mission is a joint effort by NASA, the European Space Agency and the Italian Space Agency.